OK this is one of those cases that surprises even ME! Monday was a holiday so I was distracted and finally got to our message today. First I drew the Gratitude card, but when I got to writing about it, I felt like I wanted something else. We hear that we should be grateful so much from so many sources. So I put it back in the deck, shuffled again, and DREW IT AGAIN! 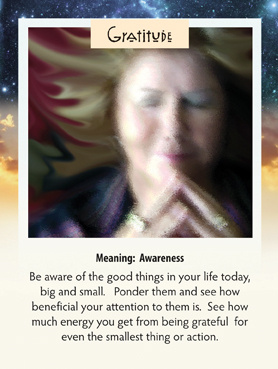 So, here it is…we are supposed to be as aware as we can of the good things in our lives this week. There are so many dramas and traumas in the world now. The times, they are a changin’. If you are living what would be considered a normal life, you should be extra grateful because so many people aren’t. No earthquakes, floods, fires or wars? Wow…that is really a lot to be grateful for. Even if you are going through one of those things, there is always some kind of treasure to be found in the ashes. Someone coming through for you, learning to treasure what you saved, appreciating that you survived…all things to be grateful for. Now let me take off the Pollyanna hat and tell you why that is important to you. We are energy fields, vibrating at a certain frequency. If we are depressed, no matter the circumstances, we will lower the energy all around us and draw those that are in the same low energy state to us. If we are feeling grateful (not happy necessarily, but grateful) then our energy raises up and we draw those that are in THAT state around us. So what do you want around you. Like they always say, “The better it gets, the better it gets”. Try to remember that this week and every time you think of this, look around and find something to be grateful for. Turn up the vibes friends!